Twenty three year old Nilupul Silva developed her love for music at tender age while watching her older sister at the piano. She was three years old when she began taking piano lessons and sat for her first Trinity College examination at the age of four coming out with flying colours.At the age of six, she began playing the violin and it is in this she has excelled. The passion for music she developed at this young age led her from success to success in the field. During her years at her alma mater, Vishaka Vidyalaya, Colombo, Nipupul was leader of the school orchestra ad Recorder Group and she also helped steer her school to victory at many events in the All Island Inter School western music competition held by the Ministry of Education. 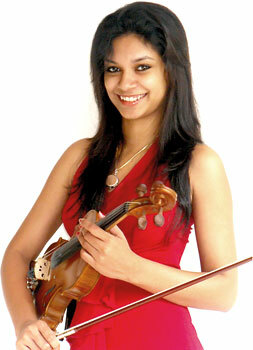 Nilupul has been a member of the Symphony Orchestra of Sri Lanka since 2002 and plays first violin. She has also had the opportunity to represent Sri Lanka at the Asia Orchestra Week in Tokyo in 2007. But along with her career in music, Nipupul has learnt to juggle a career in marketing and management having completed her degree in the field and is now attached to a private company in the field of brand management. “Music is my passion. I juggle it with all the other work I do. Even during my A/Ls I continued with my music,” Nilupul said. Her latest venture has been the opening of her music schools by the name of “Muscialite” situated at Fife Road in Timbirigasyaya. “I started it about a month ago and here I teach the piano, violin, recorder, voice training and theory of music,” she said. Nilupul hopes to further her career in music as she juggles her office life, teaching and performing with the symphony.